R.M.S. Empress of BritainThe RMS Empress of Britain was an ocean liner built between 1928 and 1931 and owned by the Canadian Pacific Steamship Company. It provided scheduled trans-Atlantic passenger service from spring to autumn between Canada and Europe between 1931 and 1939. This ship was distinguished by the Royal Mail Ship (RMS) prefix while in commercial service with Canadian Pacific. We’re nearing our destination, dearest Mildred, and I want to send you a word by the quickest way back to tell you how glad I am I came, and to thank you, because had it not been for you I doubt whether I’d have made the effort. Bill and I have been sleeping most of the time on board—he 12 hours at a stretch night after night, and I a modest 8 or 9, pretty good, for me. He is now looking blooming, and is dazzling the ship with his squash and tennis. Betsy, it seems, is to be at Southampton tomorrow. Thinking over the collections, public and private, I saw in America, what strikes me most is the general neglect and ignorance of Byzantine. If it were not for the Morgan Coll. and Library, there’d hardly be a first-rate Byz. object, outside of the Oaks, and a crude light is thrown on American knowledge of Byz. 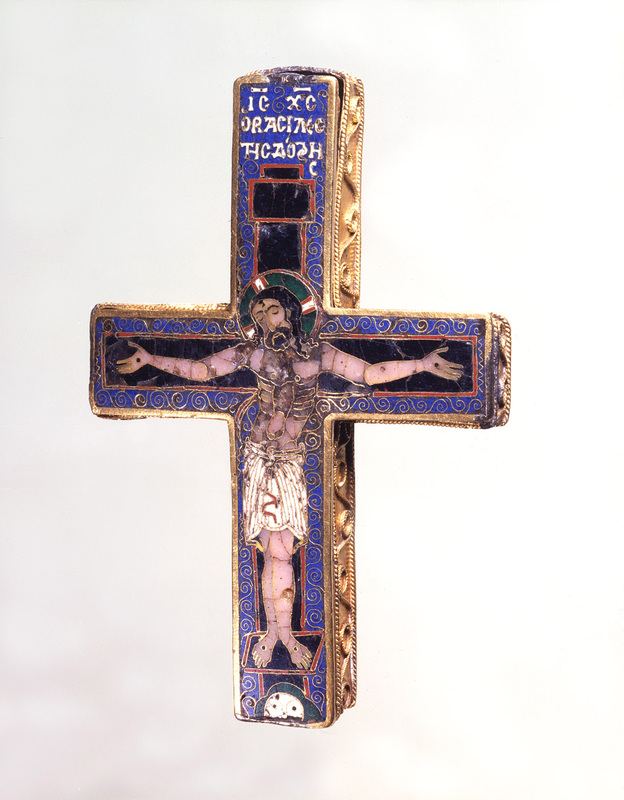 by the fact that whereas not one single European museum or big collector fell for a single one of the Botkin enamels, there are to be found in Boston, the Fogg (belonging to Arthur Sachs),Seated Christ, gold cloissoné enamel, Harvard Art Museum, Arthur M. Sackler Museum, 1947.7, gift of Arthur Sachs. The enamel is accessioned as Byzantine, twelfth century. Arthur Sachs (1880–1975), banker, collector, and brother of Paul Sachs. After Arthur Sachs graduated from Havard College in the class of 1901, he began working for his family’s investment company, Goldman, Sachs and Company, in New York City. In 1904, he became a partner, and in 1906 he married Alice Goldschmidt. Detroit, Mrs. Otto Kahn’s coll.,Adelaide “Addie” Wolff Kahn, the wife of Otto Hermann Kahn (1867–1934), a German-born American investment banker, collector, philanthropist, and patron of the arts. The gold cloisonné enamels owned by the Kahns—Christ Flanked by the Virgin and Saint John (52.54.1), Crucifixion (52.54.2), Ascension (52.54.3), Saint Michael (52.54.4), Saints Peter and Paul (52.54.5), Saints James and Andrew (52.54.6), Saint Mark (52.54.7), Saint John the Evangelist (52.54.8), Saint Luke (52.54.9), Saint Simon (52.54.10), and Virgin and Child (52.54.11)—are now in the Metropolitan Museum of Art, New York. and the Morgan LibrarySaint Luke, AZ103; Saint Theodore, AZ104; and Saint Theodore, AZ105. See O. M. Dalton, “Byzantine Enamels in Mr. Pierpont Morgan’s Collection,” The Burlington Magazine for Connoisseurs 21, no. 112 (July 1912): 219–21 and 223–25. (where BelleBelle da Costa Greene (1883–1950), the librarian to J. P. Morgan and, after his death in 1913, to his son Jack Morgan and the Morgan Library in New York. is on to them) and perhaps elsewhere. By the way, the BurnsWalter Spencer Morgan Burns (1891–1929), a British art collector and financier, was a nephew of J. Pierpont Morgan and a partner in his firm, J. P. Morgan and Co., as of December 31, 1897. cross,BZ.1936.20. At this time, the reliquary cross was owned by Ruth Evelyn Cavendish-Bentinck Burns, the widow of Walter Spencer Morgan Burns. of which I sent you photos, in 1931, is still in Drey’sThe firm of A. S. Drey was founded in Munich in the 1860s by Aaron S. Drey. The firm later expanded to London and New York. In New York, Aaron Drey’s grandson, Paul Drey (1885–1953), was a senior partner of the Paul Drey Gallery, founded in 1920. hands in N.Y., and I think you might like to have a look at it. It’s by far the finest Byz. enamel I’ve ever seen on the market, and would be a great acquisition. By making an unseemly noise, Hayford and I succeeded in buffaloing the old ladies at the Cooper UnionThe Cooper Union Museum for the Arts of Decoration, now known as the Cooper-Hewitt National Design Museum, a subsidiary of the Smithsonian Institution, was founded in 1897. The museum was initially part of the Cooper Union for the Advancement of Science and Art, a privately funded college in New York. into opening their cases and letting us look at their textiles in daylight. Normally only visible by electricity! They have nothing that we don’t know elsewhere, but their example of the red and gold elephantTextile with elephants, senmurv and winged horses, silk, eleventh–twelfth century, Cooper-Hewitt Museum, New York. See The Glory of Byzantium: Art and Culture of the Middle Byzantine Era, AD 843–1261 (New York: Metropolitan Museum of Art, 1997), 414–16, no. 271. Another fragment of this textile is in the Musée de Cluny, Paris, acc. no. 22.818, unpublished. is better than either the BarcelonaMuseu Textil i d'Indumentaria, Barcelona, inv. no. 32,942. See The Glory of Byzantium: Art and Culture of the Middle Byzantine Era, AD 843–1261 (New York: Metropolitan Museum of Art, 1997), 414. or the BerlinThe Berlin fragment was reportedly destroyed in the Second World War. Kunstgewerbermuseum, Berlin, inv. no. 91.157WWII. See Otto von Falke, Kunstgeschichte der Seidenweberei 2 (Berlin: E. Wasmuth, 1913): 11, fig. 237. See also The Glory of Byzantium: Art and Culture of the Middle Byzantine Era, AD 843–1261 (New York: Metropolitan Museum of Art, 1997), 414. one, and they have good examples of the two Bargello pieces.Museo Nazaionale del Bargello, Florence, inv. no. 634/F. See The Glory of Byzantium: Art and Culture of the Middle Byzantine Era, AD 843–1261 (New York: Metropolitan Museum of Art, 1997), 414. We’d like to have photos.—I gave Robert a note specifying those we want. At the C. Union they have nothing but playing-card-size photos., which are no good for our purposes. I’d be grateful for good big ones. The grand things I saw are the Egyptian rooms in N.Y.Metropolitan Museum of Art. and Boston,Museum of Fine Arts, Boston. and the Greek room in Boston, not N.Y., where though there are individual fine things, I think the general effect deplorable, and a lot of the recent purchases muck, the Sumerian and Central American things at PhiladelphiaPhiladelphia Museum of Art.—and of course the Widener Coll.The Widener Collection, the art collection of Joseph Early Widener (1871–1943) and his father, Peter A. B. Widener (1834–1915), a wealthy transportation and real estate magnate. The collection was housed at Lynnewood Hall, a 110-room Georgian-style mansion in Elkins Park, Pennsylvania. In 1939, Widener gave much of his art collection to the National Gallery of Art in Washington, D.C. and a lot of superb pictures in N.Y. I very much liked the choice of modern French paintings and drawings at the Fogg, and the Central American things they are showing are superb—as also those in the Mus. of Natl. History in N.Y. I was rather disappointed by the Western Medieval things at the Fogg. The capitals from Moutier-St. JeanCapitals from Moutier-Saint Jean, Burgundy, ca. 1125–1130, limestone, Harvard Art Museum, Fogg Museum, 1922.16–27 and 1925.9.1. See Walter Cahn and Linda Seidel, Romanesque Sculpture in American Collections, vol. 1, New England Museums (New York: B. Franklin, 1979), nos. 1a–m, figs. 120–133. aren’t really first rate: poor relations of Autun and Saulieu. In fact the only good piece of Romanesque they have is a capital from Aguilar de CampoAguilar de Campo, a town in the Spanish province of Palencia. The capital that Royall Tyler refers to in the Fogg Museum is probably 1926.4.1.A, a limestone capital of engaged twin columns, ca. 1185, from the Abbey of Santa María de Lebanza, Palencia, with Christ in Majesty exhibiting his wounds, a disciple with lance and a disciple with nails, and two disciples with a double cross. The Fogg Museum has a second capital from Santa María de Lebanza: 1926.4.2.A, a limestone capital of engaged twin columns with two holy women and an angel at the tomb, the third holy woman, and Christ as a Gardener. See Walter Cahn and Linda Seidel, Romanesque Sculpture in American Collections, vol. 1, New England Museums (New York: B. Franklin, 1979), nos. 54a-1 and 54b-1, fig. 213–215. which is extraordinarily close to one in the choir aisle of Sens Cath. Of course I don’t forget the Persian and Far Eastern stuff, of which there are masses and some of it very fine, and the Myers textiles.The Textile Museum in Washington, D.C. In 1925, George Hewitt Myers (1875–1957), an American forester, collector, and philanthropist, founded the museum with a collection of 275 rugs and 60 textiles. You see what I’m driving at—in fact you knew it all before I started—there’s a huge void in American collections and knowledge, and it’s the whole Byzantine realm. You’ve already done much towards filling it. Opportunities of doing more won’t occur very often, but they will turn up from time to time—e.g. the Burns crossBZ.1936.20. 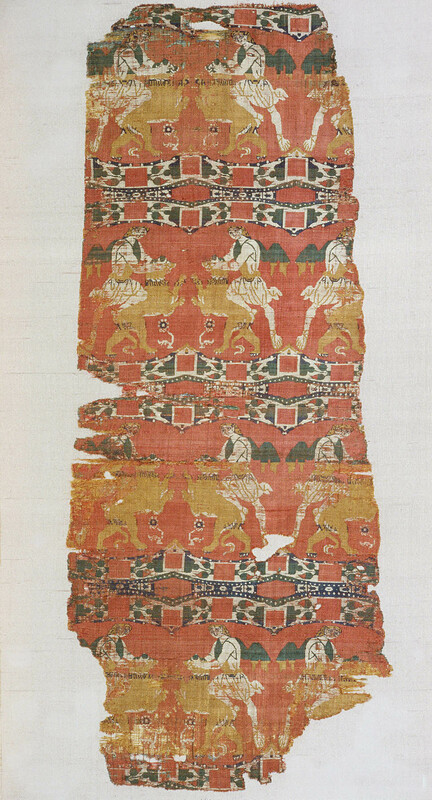 and the Sangiorgi lion-tamer textile.BZ.1934.1. About textiles, I gave Robert the address of Elsberg (51 E 57th St.),H. A. Elsberg (d. 1938), a French collector of antique textiles (especially silks), who gave examples to museums—including the Metropolitan Museum of Art, Cooper Union (now Cooper-Hewitt Museum), Boston Museum of Fine Arts, and Cleveland Museum of Art—to help build their textile departments. See Gertrude Underhill, “Textiles from the H. A. Elsberg Collection,” The Bulletin of the Cleveland Museum of Art 26, no. 9 (November 1939): 143–46. who is a silk importer and who knows much more about textiles than anyone in the Museums. He isn’t a regular dealer, and would probably be very troublesome to deal with, but he’s endlessly learned, and less crazy than most specialists. I’d look him up if I were you. He has that piece of the Ursula shroudSee letter of October 25, 1930, in which Royall Tyler describes this textile as “the Griffin and bullock silk from S. Ursula in Cologne” and states that it was recently sold by the Parisian dealer Henri Daguerre. This silk has not been identified. But a ninth-century silk, measuring 60 cm x 52 cm, that was used to wrap the relics of Saint Hippolytus and that had rows of griffins attacking bulls, remains in the Treasury of the Church of Saint Ursula, Cologne. See Stephen Wagner, “The Impact of Silk on Ottonian and Salian Manuscripts,” in Textile Society of America Symposium Proceedings (2002), http://digitalcommons.unl.edu/cgi/viewcontent.cgi?article=1425&context=tsaconf (accessed September 8, 2015). from the Seligmann Coll.It is not known which Seligmann Collection this textile was in. The Arnold Seligmann Collection was sold at auction in 1935. See Collection de Mme. et M. Arnold Seligman (Paris: N.p., 1935). which I wanted to entangle you in, but little else Byz. Lots of early Islamic, and extremely rare and interesting. He knows a thousand times more than Miss YeatsPossibly Susan Mary “Lily” Yeats (1866–1949), an Irish embroiderer who in 1908 founded the embroidery department of Cuala Industries, with which she was involved until its dissolution in 1931. or the Cooper Union dames. Confound that Walters Coll.! How I long to see the rest of it, and see it properly! Blessings on you, dearest Mildred. I’ll soon be back in Pest.